Paul Barden Roses: 192-09-04: revisiting the Hybrid Bracteatas? 'Out of Yesteryear' has its limitations. For me, the biggest obstacle was its tendency to wash most of the color out of its progeny. You could cross it with the darkest yellows, the richest oranges and reds and end up with pale buttery yellows, pinks and the occasional peachy "art shade". Oh, and white. Lots and lots of white. I quickly began to focus on working with the most strongly pigmented offspring, moving away from 'Out of Yesteryear' as quickly as possible. One such seedling was 174-02-17, which I have spoken of several times. 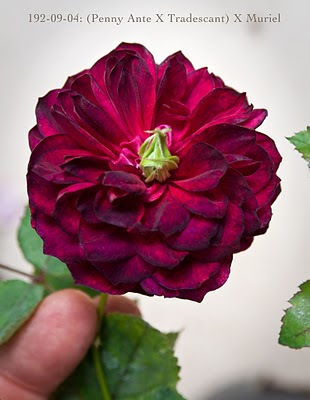 (Click the link to see the posts mentioning it) Still, I wished there was a true RED Bracteata hybrid to work with. So, periodically I have gone back to 'Muriel', Moore's original hybrid, to poke around in its gene pool in search of better color. Enter stage left: 192-09-04. The seedling pictured here is a cross of ('Penny Ante' X 'Tradescant') and 'Muriel'. The seedling used as seed parent is one I find I often go to to search for color in difficult situations. While the plant itself is very stiffly upright in the manner of many Hybrid Teas, it produces astonishing panicles of up to 40 blooms and does not exceed six feet in height. It will take pollen from absolutely anything and most all seeds germinate, so it has become a kind of "go to guy" in my arsenal of breeders. So, in May of 2009 I dash a bit of 'Muriel' pollen on a few blooms of it and voila! We have the seedling pictured above. I can't provide a lot of data about the plant yet, as it made only minimal growth in year one: it is still only 14" tall and three branches. It bloomed twice in year one, which suggests it will be free blooming. It appears to have no pistils/stigmas, so it is likely to function as a pollen parent only, assuming there is any fertility there at all. (I have seen little evidence of stamens yet either, but won't rule out the possibility until it is older) Only time and trial will tell. Still, I am hopeful. It has remarkably good coloring for a 'Muriel' hybrid; perhaps I tapped in to the 'Guinee' red in its background when mating it with my "Penny-trad". Side note: sowing the 2010 crop of seed today, hoping to finish up the task. (I started two days ago) I can't believe its THAT time already! Yikes. Have a good weekend, all. Very admirable of you, Paul, to just keep plugging along. I guess it's the reward of seedlings like 192-09-04 that keep you going and working so hard. And very interesting science. Really, I never tire of your posts, though quite a bit of it is way over my head. Paul, Thank you for freely sharing your immense knowledge. You encourage so many with your kind wisdom. Paul, was this photo taken recently? Is it this season's flowers already??? If so this is huge step forward with the bracteata line based on how bracteata does for me here. You are colder than me here (our lows are about -7 and snow never settles), but bracteata is the most frustrating species to work with because it doesn't start flowering until the end of summer for me. Everything I'm using has been pollinated already and hips are half formed by then and I have to resort to doing very late, early to mid-autumn crosses on whatever still has flowers at this time of year. If this seedling has flowered already that would be amazingly early wouldn't it? I've gone back to 'Many Happy Returns' again this season as well as onto 'Bonica' because their hips take the shortest time to ripen. I would love an early flowering bracteara hybrid, especially of such a rich beautiful colour. What bracteata characteristics are so far showing up in this new seedling?